Ahlstrand and Joseph Lampel, Second Edition, 2009, 441 pages). Definitely one of best readings I had in all my contact with business books. Why so good? Because it is scientific, imaginative, comprehensive. It is not every day that one can call a book scientific, with the exception of normal textbooks, of course. Strategy Safari, although being produced by academics, and clearly some good ones, is not a textbook and is not “academical”. The book simply manages to achieve something that is not easy: to follow the rigor of a scientific field, but without sounding too technical or obscure. Being a book written by good academic people means here not only rigor and quality of content, but also an inherently high quality of language. This kind of quality that just makes the reader eager to continue until the last page. The book, notwithstanding, is also imaginative. First, because it chooses excellent analogies and metaphors by which to present its content – starting by the idea of inviting the reader to a safari around the beasts of the strategy world. In addition, excellent diagrams are present overall, and even good poetry. Such a level of elegance is only accessible to a combination of intelligence and maturity over the concepts involved. Finally, the book is comprehensive in its analysis of strategy as a field, and not only the academic research field, but also that one of practitioners in the industry. The text goes from higher philosophical discussions to the lower levels of specific strategy receipts sold by consultancy firms. Always with plenty of sources and insights, and a good amount of quality criticism. What can I say to conclude this short review? 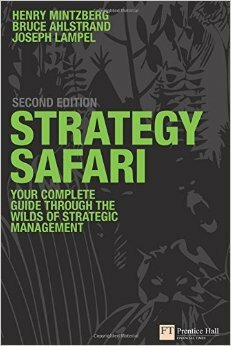 Just that you should absolutely read the Strategy Safari, if you have any interest in strategy whatsoever. The book is great, and you are not going to regret the time well spent with it.